Drinking coffee...reading email... looking at Pinterest... nice and quiet in the house!! Gotta love it! Well, my friend Karen and I are on a new "iPhone Game Adventure" !! We have just begun to play "DrawSomething" and it is hysterical. I don't have the entire process down yet... but I will soon. Basically - I draw something and send it to her... she can watch the screen as I'm drawing it. Then she has to guess what it is (now that's the challenge right there...whew...) If she guesses it correctly she wins "coins" that keep accumulating. (haven't figured out what I do with them yet). Well.... it's hysterical! Last night... Karen kept trying to draw something.. and for the life of me - I COULDN'T FIGURE OUT WHAT IT WAS! I felt so silly. Was it a tree? NO Was it an Indian tee pee? NO Was it a mountain ski slope? NO ... then she's drawing little stick people standing at the bottom of it ... hhhhhhmmmmmmm.... what in the heck was this thing. Guess what it was.... come on... just guess!!! The word she was going for was PARIS and she was drawing the Eiffel Tower. DUH... I felt so stupid! I was laughing my guts off! It's so much fun. So... if you have an iPhone... go to your Aps and search for DrawSomething... it's the FREE one! Then we can all act silly and draw together! You can search by name or user name (oldgreencupboard). Hey... look what I found!! 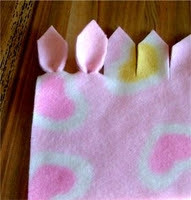 Well.. this link Fleece Blankets shows you how to make the edging on this blanket with NO SEWING! PLUS.. it's fast and pretty darn cute. I think I may look for something like this to make a scarf out of when we go to Alaska! Fleece is so warm, soft and cozy. Joann's Etc. used to have a HUGE selection. I haven't looked in sometime... so who knows what they have now - but it's worth a try. Look at this cabinet! Isn't it to die for? It's just an ornate cabinet (I've seen these go at auctions DIRT CHEAP... like maybe $100.00! No kidding!) where they have removed the doors. Painted it the color of their choice and it's good to go! I love it... isn't it precious? It would be adorable in a child's room for books, stuffed toys, etc. 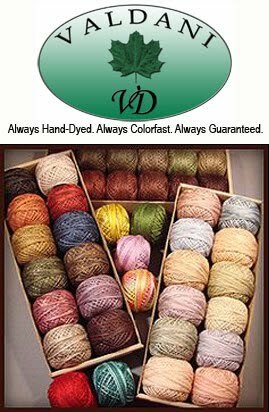 Or... how about in your sewing studio full of fabric or wool? YUMALICIOUS!! LOVE, LOVE, LOVE this clock. It immediately made me think of my girlfriend, Cathy. 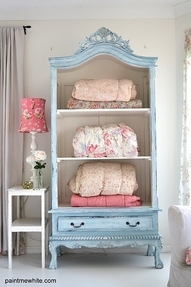 Her bedroom and sewing studio is all shabby chic and this would be perfect for her. 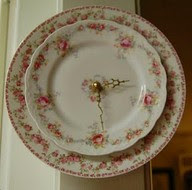 You simply take two plates you love, drill a hole in the middle of them (make sure you research the correct way to drill through glass) then add your clock feature! How cute is this? People would pay GOOD MONEY for these - they don't want to make them... only buy them. Sometimes "writing a check" is the best crafting project in the world! Did you know you could iron adhesive letters to your walls? I had NO CLUE! But what a great idea. The different things you could do are endless. They have companies where you can order those wonderful "sayings" and stick them on your wall. My daughter had one in her old apartment... it was so sweet. Now you can make your own! They may not be as fancy... but in the right place - they would be awesome. Great in a kids room!! You've heard me talk about "making memories". Isn't this an adorable sign? It would be perfect for in a child's classroom... especially in kindergarten! HA!! Or how about in the playroom? Here's another "memories" fun, EASY, project. Find yourself a BIG glass jar (with a lid - to keep out the dust). Every time you attend a fun event, concert, fly somewhere, eat at a great restaurant (paper menu, matches, paper napkin, coaster) put it in the jar. 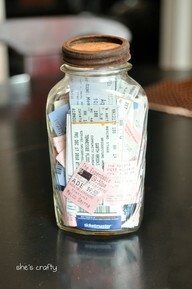 Wait a couple of years... and then go through the jar together.... remembering those memories together. Isn't that a sweet idea? It would be fun to do with your kids pictures they make you. After they've been removed from the refrigerator - date and put their age on it. Roll them up and place them in the jar. Then on their 10th birthday... pull them all out and have fun "remembering" together. Wait until you see the look on their faces when they see the drawings. It's really funny... they won't remember hardly any of them! 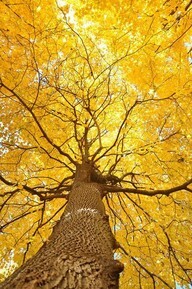 Look at this tree!!!! I remember having trees turn this color on our farm. Bright - bright YELLOW and then some were all ORANGE. Simply breathtaking! Thanks God! So pretty! 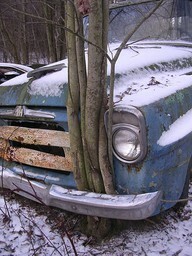 So this truck has been in the woods for quite sometime... wouldn't you think? This is a great photograph. hhhmmmm I wonder what year this truck is?? OLD... I know that for sure. Wouldn't this make a great jigsaw puzzle? I think I should be a designer for puzzles. Can you tell my hubby loves to put them together? He's always got one to work on while he watches TV. Hope you have a great day today! Have some fun and get alot of things done on your TO DO list. That's what I'm gonna do today!